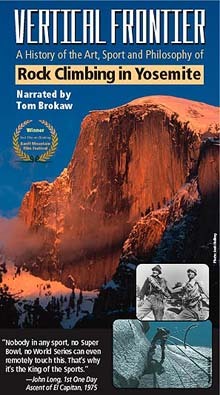 From John Muir in the 1860s to the super athletes of today, "Vertical Frontier" is the character-driven story of the art, sport and philosophy of climbing the legendary big walls of Yosemite. Nowhere is the expression of this way of life more pronounced than at Camp 4. Looking east, toward Half Dome, the morning sun reaches Camp 4 before any other campground in the Valley. For the climbers, this dusty, boulder-strewn campground is their mecca, their gathering place...and often their home. >> Order a DVD from us. [Customers outside the USA: We will contact you regarding additional shipping/handling charges and/or other fees]. >> Download Vertical Frontier to rent or own. >> See a list of resources for Vertical Frontier.